I had a very similar Simrad experience on Tanglewood, and my blog (MVTanglewood.com) has been referenced in various comments on your blog. Sorry you had to go through the same thing. I had a long litany of issues, and Simrad was unable to fix, or even give me a plan to fix any of them. Possibly the worst of them was the near useless MARPA performance, which their engineering team in NZ finally reproduced and confirmed was a design/software issue. They said it would be fixed in 6-9 months, but I elected to abandon the Simrad gear and switch to other. It has now been 2.5 years and they still have not fixed the MARPA performance, so in retrospect I made the right decision to cut bait. Lots of people try to blame it on the radar begin a small, consumer device, but Furuno’s similarly sized, consumer devices perform as expected, so there is no merit to that excuse. It’s all quite a shame because I genuinely believe Simrad has a good – even exceptional – system architecture and strategy. That’s why I bought into it in the first place. But the implementation quality level is very poor, and only suitable for the center console market where people generally don’t know good from bad. It’s not their fault – they just haven’t used a wide enough selection of equipment to know what should be expected. Anyway, I’m now very happy with my collection of dedicated devices, each best-in-class, but still integrated using industry standard interfaces so I’m not locked into any one vendor. The results have been very satisfying. This entry was posted on Wednesday, March 8th, 2017 at 12:58 pm and is filed under Cruiser's Tech Talk, Dashew Logs, FPB 78, The Logs. Both comments and pings are currently closed. Yet another example of the “walled garden” approach under performing a standardized open architecture platform. The worst part is that as long as the center console market segment Peter Hayden mentions keeps buying Simrad there is no incentive for them to correct the issue. 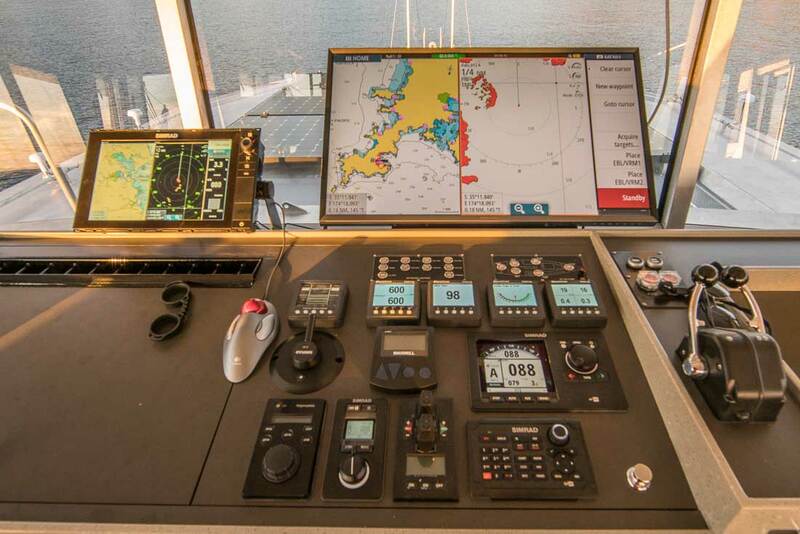 My turn to be Captain Obvious–I bet you were at least a little miffed that you didn’t come across Peter’s blog about his experiences before you made your choice to go with the Simrad suite. Not rubbing in the salt–more commiserating because I have been there more than once. Actually Gene, we were well aware of Peter Hayden’s issues, discussed them with Simrad, and were assured they had been or were being addressed. I was close to pulling the trigger on a navigation package nearly identical to what you have on COCHISE for our 60′ steel hull trawler CONGRIO. See Passagemaker Magazine March 2017 issue, page 60, for an article about the boat. The advice I have received from several “experts” is stay with an integrated system of one brand. In addition to the benefits you point out is that if something goes wrong with one component the finger gets pointed at the other guy and nobody solves the problem. Perhaps the development of sophisticated integrated systems is regressive. Our last boat had a mixture of Furuno radar, Simrad autopilot and chart plotter, and ICOM radios we bought in 1999 and it all worked, including the Furuno MARPA, flawlessly. The question I have is, do we now go with a single brand integrated system or a collection of the best in class of dedicated devices? I tally Peter Hayden’s vote for the latter. Is anybody else using a collection of different devices these days and contrary to what experts tell me, do they talk to each other as they are advertised? Based on what wee know so far I would choose the best in class and not worry about integration. This worked for us before we “integrated”. The Simrad gear is OK, excepting the Halo radar. When I was sailing around the North Sea/Norwegian Ocean, instrumentation was not so crucial as I was never more than 2 days from land. But crossing oceans, that’s when exact and durable guides are important. So sharing your views after testing the Simrad equipment over a long period, is very very useful to others. Best Regards to the SetSail Team and the SetSailor Community at large. Interesting article! Since you asked for comments on experience with integrated instruments, here is our take on it. On our aluminium Dijkstra 55 we have chosen to install a rather minimal set of instrumentation. Installed 2014, now 10.000 miles both in cold, north Norway and warmer, Portugal, Azores circumstances. We have chosen mainly instruments we had good experience with on our last boat. Sailing instruments: B&G Triton, performance ok although the 5 clocks had different SW versions when delivered and upgrading proves fairly difficult. The water temperature gauge which is integrated in the DST 800 gauge is broken, no warranty and according to Navico NL “most of them are broken…”. We had loads of issues with the 3G B&G radar which was replaced under warranty after considerable pressure from our side by Navico in Norway when we were sailing back from Lofoten. Our Simrad NSS 12 would not recognise radar or lost communication with the 3G in at least 50 percent of the operating time. At that time we decided to replace by Simrad 4G. Performance of the 4G radar is much better and this radar never lost communication. We have a stand alone Furuno GPS and NAVTEX which are only connected by NMEA 0183. Our Raymarine S3G is connected via NMEA 0183 as well. VHF is Sailor 6222 class A DSC. AIS is Versper marine X8000 connected via N2K. We decided not to connect our engine information since our very basic BetaMarine does have the gauges and we want to keep things as simple and basic as possible. Other than the issues mentioned we are happy with navigation instruments performance and reliability.